There were a few wobbles along the way and a climax that didn't make complete sense to me, but Being Human's last ever episode was a triumph on most levels. The Devil is a difficult character to portray (especially regarding the limits of his powers), but I liked this show's take on an old idea with Captain Hatch (Phil Davis) in his sharp suit, cane, and yellow tie. It gave the show some uncharacteristic scope having a whole town becoming a disaster zone, after Hatch caused mass suicide by willing it on the population (in scenes wisely left to the imagination), and Old Nick's goal of amplifying his ability via television was mad yet logical. I especially enjoyed his televised speech from a local TV studio operated by a crew of "zombies", complete with a 1950s-style interlude when he was interrupted. But while the episode certainly had its fair share of hokum, there was enough of a serious side to make the story land some emotional punches. 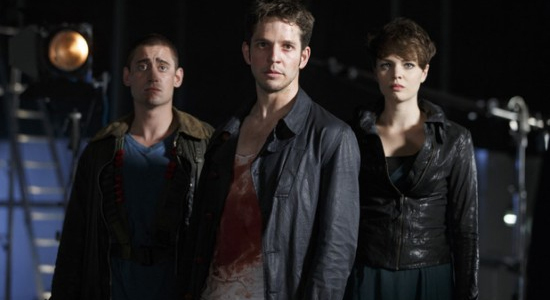 I didn't like Bad Hal's (Damien Molony) introduction singing a show tune in a pub as he sired a gang of vampires, but Tom (Michael Socha) single-handedly slaying them all was a terrific moment. It was just a shame last week's cliffhanger with ghost Alex (Kate Bracken) trapped in her own grave amounted to very little—with Toby Whithouse writing himself out of this corner by having us accept Hatch's trap somehow didn't factor in her ability to walk through solid objects. Of course, the most memorable aspect of this finale was seeing Hatch try and constructively prevent the heroic trio from destroying him by performing a blood ritual. Here we saw each of the characters transported to tailor-made fantasies, which the Devil offered them in exchange for their inaction in the real world. Hal found himself on the battlefield he almost died on before becoming a vampire, reacquainted with werewolf friend Leo (Louis Mahoney) who begged him to change the course of history to save the hundreds of people he's killed; Tom was given the chance to live with werewolf girlfriend Allison (Ellie Kendrick) and raise an unborn son together; and Alex found herself back in her family's caravan with her father (Gordon Kennedy) and able to avoid dying that same night. This was undeniably the highpoint of the episode and a brilliant way to show the insidious nature of Captain Hatch in action, while also giving us some juicy character moments and a few returning guest-stars. Tom's storyline was admittedly the best, because we have a deeper attachment to his relationship with geeky Allison, but they all had some merit. Where the episode fell down was in trying to find an ending that felt worthwhile as the conclusion of a five-year series—even if, technically, I guess this was the end of a two-year arc with these newer characters. I really loved the sequence of Hatch being shot through the head by Mr Rook (Steven Robertson) while he sat in his TV studio, which involved a brilliantly gruesome in-camera special visual... and the twist that Rook had actually been possessed by the Devil's spirit worked very nicely in the last quarter-hour, but then things kind of petered out. It just felt a little confusing that the Devil's essence was successfully exorcised by performing the blood ritual, only to careen around like a miniature version of Lost's Smoke Monster and simply return to Rook's host body to be staked and killed. Maybe it'll just take a second viewing to really understand what the intention was here, because the whole idea of the blood ritual seemed a bit muddled. However, the denouement was probably the best way Being Human could have ended—with all three characters having their "curses" lifted, thus becoming human. Maybe it was a little too neat for some people, and once again asks you to accept all the earlier chaos and death can be explained and excused, but I didn't mind having a feel-good ending for these characters. Killing the Devil presumably eradicated all vampires, werewolves and ghosts in the world, so it easily the most upbeat ending possible... with the three housemates settling down to watch The Antiques Roadshow without having to worry about the monsters lurking within themselves. Overall, "The Last Broadcast" was a brilliant conclusion of an oddly flat final year. It left me wondering why the previous five episodes weren't as deft and enthralling, but I guess it was because the narrative arc this year wasn't meaty enough to fill six hours—so there was a lot of filler and wheel-spinning. And it was unfortunate series 5's reduced episode order impacted the believability of Hal reverting to his evil "Lord Hal" persona, which didn't convince me because it felt very rushed. One sip of human blood and he was an entirely different person committing mass murder? I'll miss Being Human, but it was a good time to draw a line under the show. It's had tricky conceptual problems to solve (most notably the unexpected departures of Russell Tovey and Sinead Keenan, which prompted a cast overhaul in series 4), but it turned challenges into opportunities and kept fans engaged. Did we deserve another series with Hal, Tom, and Alex? I'm not sure. While there was definitely more to explore with those characters, the show's underlying themes had bled dry after five years. And how do you ever hope to top having Beelzebub as a supervillain?